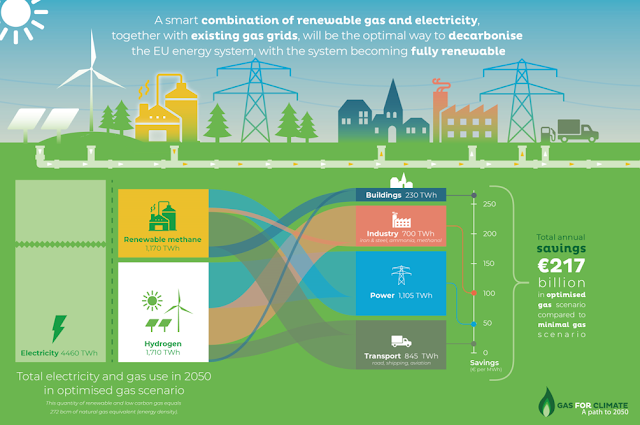 Gas for Climate, a group of seven leading European gas transport companies (Enagás, Fluxys, Gasunie, GRTgaz, Open Grid Europe, Snam and Teréga) and two renewable gas industry associations (European Biogas Association and Consorzio Italiano Biogas) has just released 2019 scenario analysis for net zero emissions energy in Europe by 2050. Biomethane and power to methane can supply up to 1,170 TWh at strongly reduced costs, consisting of 1,010 TWh of biomethane and 160 TWh of power to methane. Based on the study, production costs can decrease from the current €70–90/MWh to €47–57/MWh in 2050. These costs reflect large-scale biomass to biomethane gasification close to existing gas grids, as well as more local biomethane production in digesters. agriculture on farms producing biomethane. Estimates of biomethane production in Europe show that production can be scaled up from the current 2 billion m3 to 95 billion m3 of natural gas equivalent. Sustainability criteria as defined by current European directives will be crucial to steer the production.